Collecting plans are important parts of collections policies and can help in prioritizing new acquisitions, as well as targeting deaccessions. The American Association of Museums has posted a useful article on collections planning on its website. Authors identified “gap analysis” as one of six characteristics of effective collections planning. In order to analyze gaps, planners must contrast an institution’s ideal collection with its actual artifact accumulation. 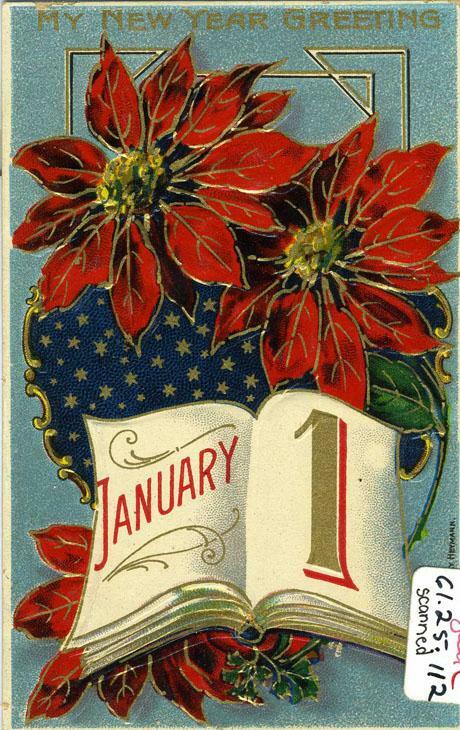 For example, at the National Museum of American History, collection planners developed a central thematic question: “What has it meant to be an American?” as a benchmark to determine the relevancy of possible artifacts. Here in North Carolina, we can ask similar questions to guide collections planning at the state and local level. “What has it meant to be a North Carolinian?” The NC Department of Cultural Resources’ collection should contain artifacts that collectively provide answers. What topics do you think get at the meaning of being North Carolinian? Link to the search and try to find relevant artifacts. Does your search yield a cache or a gap? Barbecue is one important aspect of culture statewide–something that most North Carolinians have experienced in some way. It reflects a history of poverty in its use of free range hog and fatback. The ingredients, smoking techniques, and flavors also distinguish regions. Both the State Archives and the NC Museum of History collections contain a variety of barbecue-related photographs. Yet, the only 3-dimensional artifact that results from a search for “barbeque” or “barbecue” in the NC DCR collections database is a match safe, bearing little connection to local cuisine. Outside of museum collections, North Carolina barbecue-related artifacts abound. Wilbur’s, one of the most famous eastern Carolina establishments, has an online catalog, offering several ideas. However, some well worn cooking implements or other objects could “flesh out” the story of the state’s most famous culinary custom. Does your institution have a collecting plan? Does it provide useful guidance? What are your collection’s major gaps? Does your collection contain any barbeque-related artifacts? Ten years ago the National Museum of American History made some collections planning progress. Is it now time for your institution? What's safe for food is also usually safe for artifacts. Poly boxes offer flood protection. Poly boxes create a micro-climate that will drastically slow changes in RH (moisture equilibration). Poly boxes are often available in clear, allowing for increased visibility of interior artifacts and humidity indicator strips. Poly boxes allow for a desiccated micro-environment with the use of silica gel—especially helpful in cases where metal is corroding. While all boxes deter insects, only poly boxes keep rodents out. 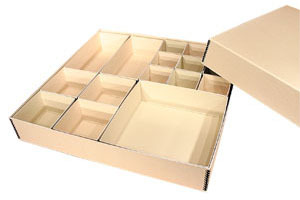 Depending on type, size, and source, poly boxes can be less expensive than archival board boxes. 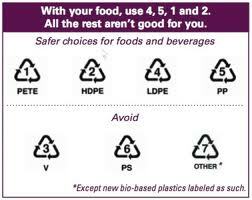 Poly boxes can store and retain acidity and do not contain buffering agents to counteract acidity. If RH level is high in the micro-climate, risks intensify. Larger size poly boxes are not made or sold for preservation purposes and may contain additives that are potentially harmful for artifact preservation. 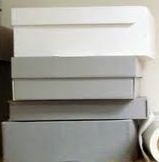 Depending on type, size, and source, poly boxes can be more expensive than archival board boxes. 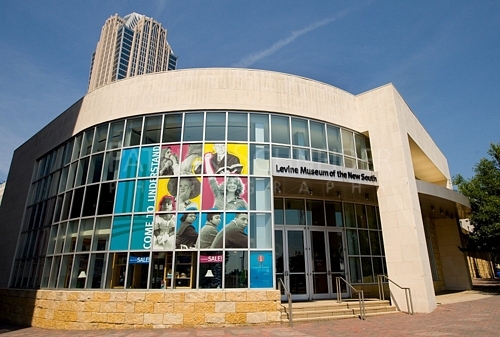 This post is by Janis Wilkens, Registrar at the Levine Museum of the New South in Charlotte. In 2008, the Levine Museum of the New South adopted the following Conflict of Interest Policy as part of its revised Collections Policy. After several unsuccessful attempts and in consultation with a lawyer who was a member of the board, we adapted language from the Statement of Professional Standards and Ethics of the American Association for State and Local History. Historical organizations and agencies exist to serve the public interest and must always act in such a way as to maintain public confidence and trust. All Board members, employees and volunteers of the Museum (“Interested Persons”) must be careful to avoid both the appearance and the reality of using their positions or the information and access gained from their positions improperly for their personal benefit or for the benefit of another organization. Interested Persons shall refrain from personal collecting of items in competition with the museum or in any manner that conflicts with the interests of the Museum. In the application of this policy, Interested Persons must use their discretion and should consider the rarity and value of the item and the potential interest of the museum in the item. Conflicts of interest under this policy will be addressed in accordance with the Museum’s Conflict of Interest Procedure. If an Interested Person believes a conflict of interest under this policy has arisen or may arise, this person should refer the matter to the executive director. The Museum, on its own initiative, also may consider conflicts and potential conflicts of interest involving Interested Persons under this policy. In the event a conflict is found to exist, the Museum may require that the Interested Person make the item at issue available for acquisition by the Museum in a manner determined to be appropriate, and under reasonable circumstances determined in accordance with the Conflict of Interest Procedure. This seems like a good policy, and in the nearly four years since it was put in place, we have never had to invoke it; however, one of the big problems with policies of this kind is the difficulty of enforcing them, or even ensuring that those to whom they apply are aware of them. How does the museum know if a violation has taken place, unless the violator informs us? Why should they inform us if they don’t even know the policy exists? What is the best way to make sure that “interested persons” are aware of the museum’s policy so they can comply with it? We have yet to wrestle with these issues. It seems enforcement must depend on the honesty and good will of those connected to the museum, and the diligence of the collections department and the administration in keeping them aware of the policy over time and changes of personnel. Should the policy include a recommendation or requirement that it be reviewed annually with all the affected groups, so at least they can’t plead ignorance? Are there other tactics that would be useful for this? What do you think? 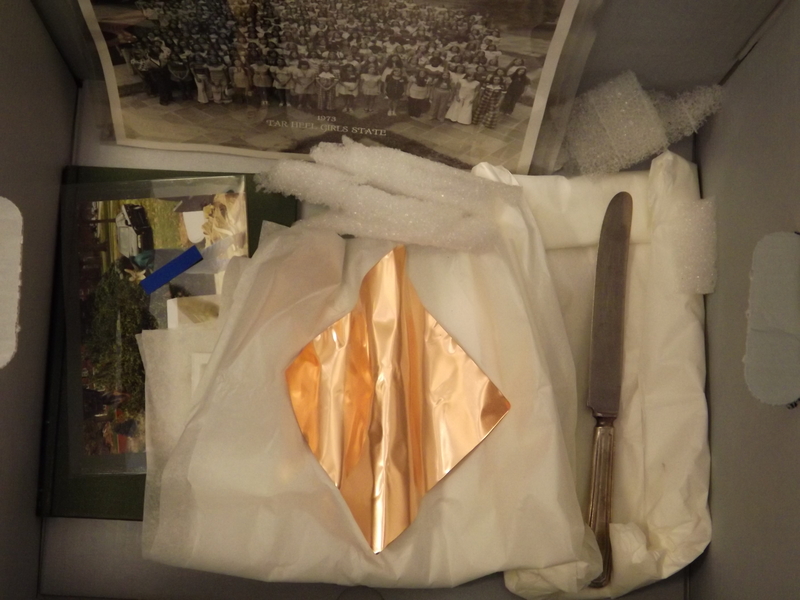 Common advice for museum storage once included wrapping all artifacts in archival tissue and then placing them in archival boxes. This method of storage not only limits access for both staff and researchers but it also poses several dangers to the artifacts inside the cocoons. Collection inventories should be conducted periodically, necessitating periodic unwrapping and rewrapping of each object. This level of handling, without the artifact’s visibility, heightens the risk of mechanical damage to the artifact. Depending on void space left in a box, staff may stack multiple cocoons in one box with the idea that the tissue will provide sufficient padding for each object. Overtime, however, the tissue compresses and many collections objects, such as baskets and dolls, can suffer from the pressure of other artifacts. Problems resulting from insect infestation, inherent vices, or failing joints can occur and will not be visible during regular inspections of the storage areas. The custom-made side-opening box allows inspection of a boxed, shelved object and eliminates the need to move the box on and off a shelf and lift the artifact out to inspect. If the artifact must be removed, a side opening allows better hand guidance for removal. This method is especially appropriate for fragile artifacts such as baskets. 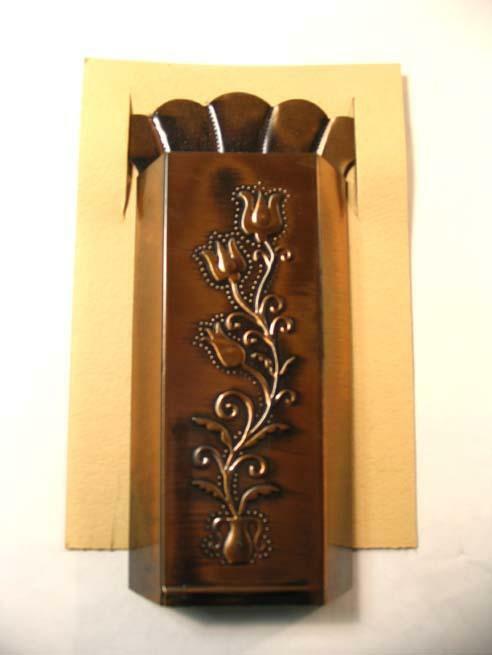 While both interior trays and boxes with mylar windows are available from prominent conservation suppliers, both can be custom-made according to your collection needs. Anne Lane, a skilled collections manager, is well versed at building custom housing for artifacts. 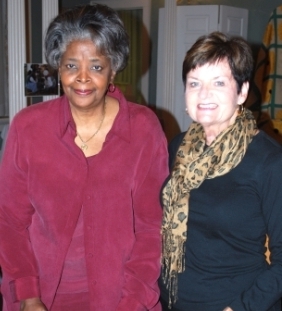 She graciously shares her expertise across the state and beyond and will be conducting a box-making workshop for C2C at the Charlotte Museum of History on February 27, 2012. Consider joining us then and learning these important preservation and access techniques. 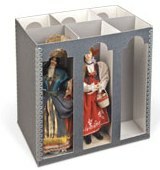 Once you have worked out ways to make more of your boxed collection accessible, you can begin to strategize collections outreach opportunities in your storage area. Some museums have had success with special tours of storage. If all collections are cocooned, however, there is not much to tour. With increased access, staff and visitors alike can learn even more about your institution’s collection. In this day of budgetary slashes and movements for smaller governments, why should tax money go toward promoting the preservation of and access to historic materials throughout the state? Isn’t maintaining a network of state-run history museums, historic sites, and a state archives enough? A centralized authority can help ensure more even distribution of cultural investment throughout the state. Cultural heritage institutions have unique capacities to nurture communities, especially in smaller towns. Strong communities are in the state’s best interest in many ways. Charles Faulkner Bryan, Jr., President Emeritus of the Virginia Historical Society, discussed this idea in his presentation at the 2011 AASLH conference. Less quantifiable than financial distribution and community building, is the idea that history-creation is a basic civic right. Although not a specific reference in the Bill of Rights, history-creating activities strongly relate to the 1st Amendment’s call for freedom of expression and the right to assemble. Telling stories of the past is an essential function in human society, and gathering places and objects enliven and enrich these histories. Both competition among similar organizations and guidance from governmental agencies can help lead history-creating organizations toward quality in their productions. If these ideas convince you that NC DCR ought to continue reaching out to private cultural heritage organizations, then funding becomes the issue and leads to more questions: which outreach activities? how much? where should the funds come from? Over the past decade or so, federal grants through the Institute of Museum and Library Services (IMLS) have paid for much of DCR’s outreach, especially through the NC ECHO and C2C projects. Other states, most notably Minnesota and Indiana, have strong statewide museum field service programs, and central offices are able to distribute state-funded grants-in-aid for projects around the state. It would be wonderful to offer financial support (in addition to the professional development and guidance we now provide) to struggling institutions across North Carolina. But the NC legislature has not yet invested in such public-private cultural heritage partnerships. On February 6th and 7th our staff will be leading a Fire Disaster Recovery Workshop that will include a controlled burn of a mock museum space. Our team will install a range of collections and storage/ display containers at the Buxton Fire Station on North Carolina’s Outer Banks. This fire station has a firefighter training facility that is equipped to demonstrate large fires and their effects safely. The primary purpose of this burn is to give our workshop participants the opportunity to practice fire salvage recovery methods. Firefighters will extinguish the fire with water, so we expect artifacts to suffer from blistering heat, smoke, and soot, as well as water. C2C’s mock museum will include: a small exhibition case containing 6 silver plate artifacts on small mounts; a hanging rack with costumes—some with covers, some without; a bookshelf with books; a metal storage cabinet with interior shelves containing books and other faux collection items. The controlled burn will also give us the chance to test the protective features of various storage containers and inserts. We will place 10 storage boxes at equal distance from the planned fire area. 2 polypropylene boxes. One of each of these pairs will contain a sachet of silica gel. We will also be including the Image Permanence Institute’s A-D strips in each of the 10 test boxes. Designed to indicate “vinegar syndrome” (acetic acid) in deteriorating film collections, these products detect the presence of many acidic vapors and may be a useful guage for the protective qualities of various preservation materials inside our test boxes. The morning of 2/7 we will open each box and record the color of the A-D strip inside and a visual condition assessment of the contents of each box. We will post results as soon as possible thereafter to this blog. Do you have any ideas or advice for this test, or the controlled burn more generally? If you are interested, please join us for the workshop! This post is by Susan Mathisen, Principal of SAM Fundraising Solutions, a New York-based museum consulting practice. These are the complaints we hear most often – “our board doesn’t do enough (or much),” “a few members do all of the work,” “we can’t seem to get them to give.” Take a good look at the membership – are they engaged and active, or are they doing the bare minimum, if anything at all? If your Board is bored, here are a few tips to help change things. A lack of Board engagement begins with members’ recruitment. Prospective members are often told that they “won’t have to do much,” as Executive Directors think that a large workload may discourage a good prospect from joining. And yet these same ED’s are surprised when the new members don’t do much. What did you expect? You told them they didn’t need to be involved! Instead, present your prospect with a detailed list of duties and performance expectations. Rarely does someone join a Board knowing what he/she is supposed to do; it is your job to educate and guide them. With regard to your extant Board, is its culture conducive to inaction and member boredom? Is it one of engagement and responsibility? Does it encourage fundraising and giving? Do only select few do all of the work? Does it set realistic goals? Think strategically? Defining the Board culture is a good way to determine areas where you can reinvigorate the membership. Recruit those with passion for what you do. Ask how they would like to be involved in the organization’s development. Connect them to the organization’s work through site visits, conversations with staff, board retreats, and telling them compelling stories about your activities and their impact. Provide them with opportunities for their involvement outside of the Board Room – and to become acquainted with other members. Equip them with the training and resources they need to be a successful Board member. That may include lessons in understanding financial statements and the organizational structure, and it almost always includes how to ask donors for a gift! Consider a mentoring program to acclimate new members. Clearly define and communicate duties and expectations. Avoid dull or unimportant tasks – let them help you with the real challenges your institution is facing. Celebrate successes and recognize those who have made a contribution to that effort. Have a peer-to-peer accountability mechanism in place to ensure members report on their activities and they are fulfilling their duties or completing tasks they volunteered to do. Challenge those who are not maintaining an appropriate level of participation. Establish committees – and set clear objectives for them. Effective committees have focused assignments and important responsibilities that advance the Board’s work. The added bonus? A Board member’s engagement in your organization is strengthened and deepened through committee work. Have a purpose to your board meetings. Would you want to go to a meeting that is long, dull, and doesn’t accomplish anything? Consider using consent agendas to move quickly through committee reports and use meetings to focus on more important matters, like strategic issues to advance the organization. It is your obligation to make meetings worth attending, since the Board members are required to be there. 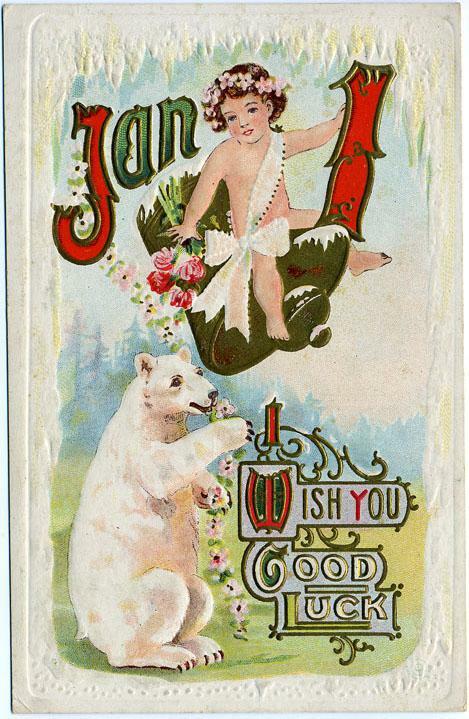 A century ago, when postcard correspondence proliferated, New Years’ greetings were common. 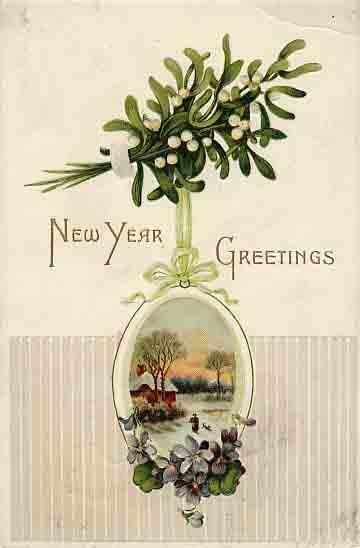 Those of us who are not organized enough to generate Christmas cards amid the rush to prepare for that holiday–by decorating, shopping, and baking–would appreciate a revival of the New Years’ card custom. The NC Department of Cultural Resources has a delightful collection of these artifacts, available for online surveying. 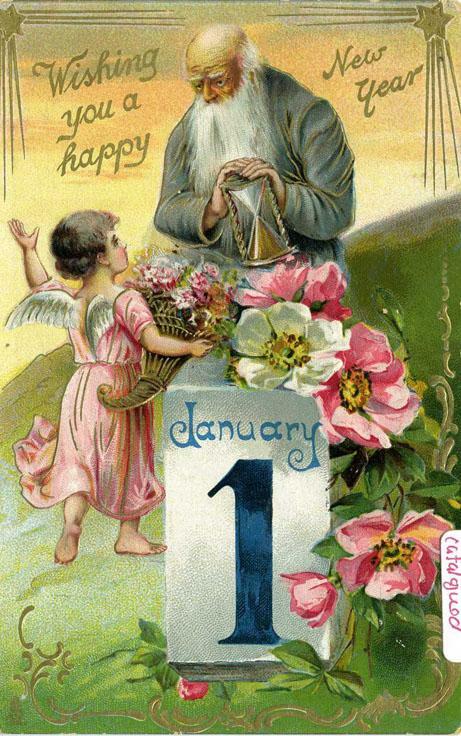 We’re posting some of the highlights here in order to wish our subscribers the very best for 2012! Eliza A. 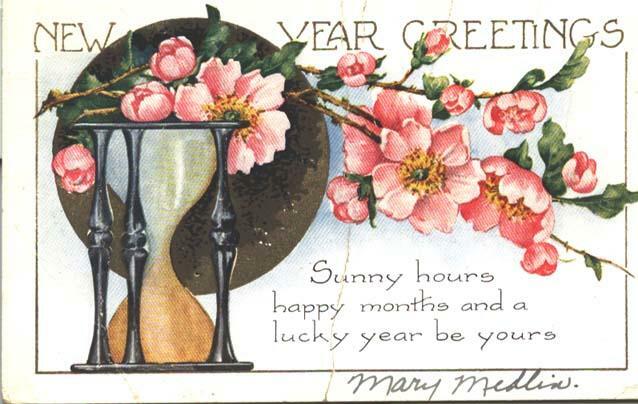 Pool, living at 214 W. Edenton Street in Raleigh, was a dedicated correspondant who treasured many greeting cards and donated them to the NC Museum of History after many decades.